Befitting its status as a sprawling and geographically diverse nationwide industry, Minor League Baseball and road trips go hand in hand. 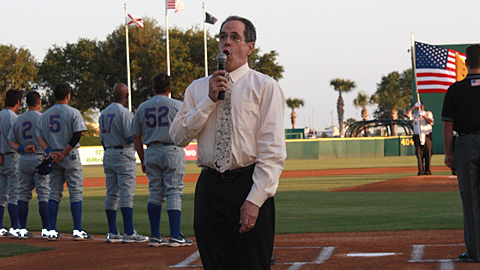 But it's safe to say that no one's ever embarked upon a Minor League road trip quite like the one put together by Whittier College professor Joe Price, who has taken a sabbatical from academia in order to sing the national anthem at more than 100 ballparks over a five-month period. Chances are that he'll soon be belting out Francis Scott Key's signature tune at a ballpark near you! Fittingly dubbed "The Anthem Project," Price's tour will take him to more than 40 states. He'll sing in four time zones and across six levels of play and expects to travel at least 15,000 miles. His companion on this trek is his wife of 38 years, Bonnie, and the couple travels in an RV emblazoned with an American flag and the words "The National Anthem for Our National Pastime." The Anthem Project kicked off on April 7 in Brevard County, Fla., with Price performing in front of a robust Opening Night crowd. His travels have been largely based in the Florida State League since then, and I reached him by phone prior to Tuesday's gig at Lakeland's Joker Marchant Stadium. The first question that comes to mind, of course, is a simple one. Why? Martin Perez recorded the fifth perfect game in Texas League history in a rain-shortened win on Tuesday. Julio Teheran earned his first Triple-A victory on Wednesday, fanning five Norfolk Tides over 6 1/3 innings. Luis Salazar managed Lynchburg's home opener five weeks after being hit by a foul ball and losing his left eye. After a strong first rehab start, the ace will face his former club when Omaha visits Nashville, Sun at 3:05 p.m.
Tigers prospect Charlie Furbush follows up his one-hitter with a start vs. the Chiefs in Syracuse on Tuesday at 6 p.m. It's an '09 Series rematch, SAL style, when Gary Sanchez and Charleston visit Jesse Biddle and Lakewood. "The focus of my project is how the national anthem and baseball combine to form the national pastime," Price explained. "I try to have the teams mention what I'm doing before I sing, so that conversations can then develop [about the anthem] with fans in the stands during the game." A professor of religious studies, Price regularly teaches a "Sports and Religion" class, and his authorial résumé includes books such as 2006's Rounding the Bases: Baseball and Religion in America. He is currently chronicling his Minor League experiences on the "Joe's Anthem Tour" blog, which will be adapted for a planned book titled Perfect Pitch: The National Anthem For the National Pastime. "The anthem represents the sanctification of the game. It's basically a way of providing an invocation at the ballpark," said Price, a classically trained vocalist who has served as a music minister at several Midwestern churches. "It exemplifies tradition itself." In keeping with this view, Price's rendition of the anthem is free from any hint of personalized idiosyncrasies. "Tradition is significant in baseball, ... and as a result I sing the anthem traditionally with no embellishments," he said. "I keep the focus on the tune and on the words." Such a straightforward rendition is often appreciated by the fans, who have become accustomed to flubbed lyrics, missed notes and diva-esque histrionics almost as a matter of course. "'I appreciate [the Anthem] not being butchered' is the most frequent comment I receive," said Price. "[Fans] like to see it done straight and done right. "And if done in a singable key, almost everyone can do it," he continued. "There's this myth it's the hardest song, but it's not that difficult even though there is a wide range. ... If you start in the key of G, then almost everyone can sing it. And even if they can't hit the lowest notes, that's a lot more pleasant than not being able to hit the highest." Entering the season, Price had performed at more Major League stadiums than Minor League ones. The first time he sang the national anthem at a ballpark was in 1977, when Mike Veeck extended the invitation to sing at the old Comiskey Park, and since then he has gone on to perform 32 times at 20 Major League parks. But such sporadic efforts pale in comparison to the monstrous logistical undertaking that the National Anthem Project required. Price started by emailing the general managers of all affiliated Minor League franchises, save for those competing in instructional leagues. "My first goal was [to schedule] 50 teams; I was thinking if I got that many then this would be a success," said Price. "But once I got 50, I thought 75 would be good, and from there I got into the upper 80s. Then [a post on Ben's Biz Blog] got several more teams enthusiastic, and I was dealing with over 100 teams willing to work with me on a date. "I had figured that there would be more reticence on the part of the teams to schedule in a way that would work with my being in the area," he continued. "But I've been incredibly amazed at their willingness to accommodate my requests and schedule." The final tally is 109 ballparks, a tour that crevasses every nook and cranny of the country. After an extended stint in the Florida State League to start the season, Price is now working slowly northward. Friday night he sings for the Charleston RiverDogs, who are owned by the same individual who gave him his first Star Spangled opportunity. "Mike Veeck called me in 1977 to invite me [to Comiskey]. And, lo and behold, he called me within two hours of receiving my [Anthem Project] email," said Price, the appreciation evident in his voice. Though Minor League Baseball teams have displayed an exemplary willingness to accommodate Price's schedule, as of yet none have tied his visit into a larger national anthem-related promotion. In keeping with his emphasis on tradition and historical perspective, Price mentions that he'd like to have lyric sheets distributed to the crowd complete with the far lesser-known second and third stanzas ("I'd especially love to sing the second stanza, because it emphasizes the theme of freedom," he said). And it's hard to think of a better public forum for such an endeavor than the ballpark, a shared community space steeped in tradition and drenched in ritual. "I always love for people to join in, and for the anthem to be sung together regardless of political orientation," said Price. "This can, potentially, be everyone's national anthem. And as a result it can bridge the gap between the Tea Party and liberals, between hawks and doves. Because, even though it is a wartime song, it was written as a celebration of freedom. The preservation of our freedoms is what lies at the heart of it."